1 - Push it out the door with a push broom, from a distance. 2 - If you can positively identify it as non-venomous, wear some thick leather gloves and pick it up and move it outside. 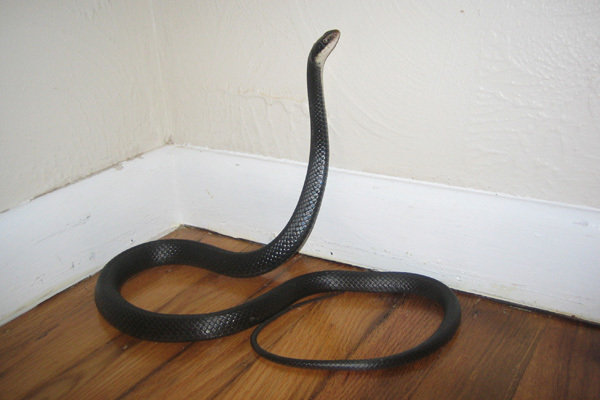 3 - If it is stuck somewhere in the house and you can't find it, use a snake trap with a sticky pad. How To Get Rid Of Snakes In Your House - Snakes are some of the most misunderstood animals in the wild. They are feared and in some cases hated. That is unfortunate because in most cases snakes are harmless and in the best case scenario they help keep other pests like mice under control. Although they are great animals they should be outside and not inside the home. There may be a time when you need to get a snake out of your house or property. When that time comes you should use all the resources you have in hand to make sure that you get the snake out quickly and in a very safe manner for both you and the snake. If a snake has gotten into your house the first thing you have to do is figure out its location. It can be a difficult thing to find even if you keep your home very organized because snakes are really good at hiding. Once you have located where the snake is then you can get to work on getting it out. One method is to chase or herd the snake out. Another way to remove the snake from your home is to use a stick to pin its head down and then grab it behind its head and remove it. When a snake makes its way into your basement it can be a bit tricky to get it out of there. For starters not everyone has great lighting in their basement, and you will need it in order to be more effective. If your basement is one of those that have the bad lighting then the best thing you can do is to use a snake trap. These snake traps can be placed anywhere near a snake. The problem is that sometimes snakes will not be fooled into going into one of these traps so you may have to do the trapping yourself. Here is a wise word of advice that you should listen to: you should do your best to find out the type of snake you are dealing with because some can be poisonous and extremely dangerous. If you are dealing with a poisonous snake do not handle it yourself, instead call a wildlife expert to assist you. If you are certain that the snake is not poisonous (most of them are not) then you can proceed to catching it yourself. Keep in mind that if you are planning to handle the snake the grab should be as fast as the snake. This is the most common location that people find snakes in. It is very easy for a snake to hide in your garden or yard, especially if there is a lot of clutter. The same rules apply when identifying a snake. If you cannot identify it or think that it may be poisonous, then you are better off leaving the trapping to the experts. Traps work like a charm in the garden because they are seen as something that may even provide some sort of shelter to the snake. There is also an easy meal inside and the first law of surviving in the wild is to take advantage of every meal. Once the snake has been trapped it is a good idea to clean the clutter that you may have there. Be careful because there may be other snakes in the area. If you do find more snakes then repeat the trapping process until they are all gone. You may find that it does not take that long to rid your garden of snakes. You can spread kitty litter on your garden as a way to repel snakes from returning. The crawlspace may be the most inconvenient location in your house to find a snake, because of the size and the lack of movement that you have once you are there. In a crawlspace it is very hard for a human to be fast, so much so that even a slow brown snake would have a speed advantage there. There are two things you can try to get the snake out of there. The first way is to place several traps in the crawlspace to give you a better percentage of getting the snake. Check the traps often. Next you may want to get some motion sensors for the area. You can try either sensors that will let off light or those that will sprinkle water. Finally, consider spreading kitty litter in the crawl space to keep the snakes from returning. Some people recommend used cat litter to fend off snakes but in an area like a crawl space you won’t want to crawl through dirty cat litter. The clean litter will be enough to aggravate a snake and keep them from crawling over it. Go back to the main Snake Removal page for more information about snakes in your house. How do you get a snake out of your home? What to do if you have snakes in your house.